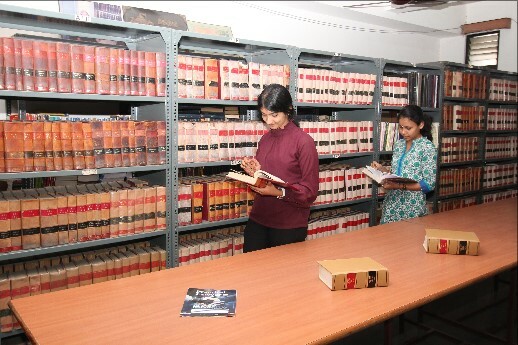 The College has a well - equipped library with nearly 11,809 books, and in addition there is a series of All India Reporter for over 75 years from 1930 to date and other back volumes and various journals numbering 1500. The College subscribes to 20 Law Journals including Modern Law Review and Harward Journal of Law & Technology besides newspapers and magazines of general nature. Several copies of the prescribed and other useful books in the various subjects of study are made available to the students. The Library has a full-time qualified Librarian. The Library is partially automated with library in house built package. The Library has CD-ROM databases and online databases containing case laws, articles and journals package and will be automated fully with Barcode technology in the near future. On enrolment, a student is entitled to get three Library Cards in the first term. One book can be borrowed against a card. Books borrowed should be returned within fifteen days from the date of issue. A fine of one rupee per book per day will be levied for each day of delay after due date. A book may be re-issued to a borrower only after it is returned to the Library, if it is not reserved for someone else. Reference books and current journals are not for issue. Library cards must be kept in safe custody. Loss of a Library Card should be reported immediately, in writing, to the Principal. The borrower is personally responsible for the books borrowed against the card. If the cards are lost, the student will be required to pay Rs. 30/- for each card. Books borrowed by a member are not transferable to another. A borrower will be issued ‘no dues’ certificate only after he / she returns all the books borrowed by him / her along with Library cards. Submission of ‘no dues’ certificate is compulsory for obtaining the memos and other certificates. Library Deposit has to be withdrawn within three academic years, after completion of the course. If not, the amount shall be forefeited. All the standard prescribed books of the course of study are lent to the students on depositing of the cost of the books. They can retain the books with them during the course of study and return after the semester examination. Nominal user charges are deducted and the balance of the deposit refunded to the students after the return of the books. Concession in the user charges is given to those students who are very regular to all the classes. The object of the scheme is to encourage students to study standard text books and to motivate them to attend classes regularly.